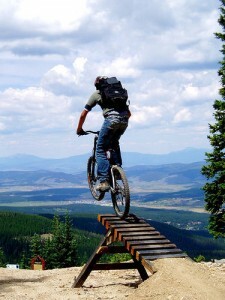 With 600 miles of trails, it’s no wonder why Winter Park has gained the title of “Mountain Bike Capital USA”. At the resort alone you will find 50 miles of single-track trails accessible via chair lifts and marked with signs identifying skill level. Once at the top of the lifts you may want to stop into the Sunspot for a quick bite to eat while enjoying the 360-degree views of the surrounding mountains. From there you can choose runs like the Upper Arapahoe, the resort’s downhill race course, or wind down The Long Trail for a 7-mile novice ride. In the Fraser Valley you can enjoy the trails of the Rocky Mountain wilderness while cradled by spectacular mountain views all around. The trails follow babbling brooks, glide through wildflower meadows and trek up rugged mountains. All throughout the summer, there are races that are open to public and are available to many different skill levels. A majority of the races either start or end at Winter Park Resort, including the finale… The King of the Rockies. Repairs, rentals and shops are easy to find, whether you are at the resort, or downtown Winter Park. You can also find a wide variety of restaurants and bars, with food that is just as good as it is diverse. Music sounds better with a backdrop like the Continental Divide, and you just may find out for yourself, as there are music festivals and concerts happening almost every weekend during the Summer. Events like the Jazz Festival and the Food, Wine & Beer Festival may require advance planning for stays in Winter Park. It would be impossible to cover all of the mountain bike trails of Winter Park and the Fraser Valley in one short article. However, once you get to here, there are a number of free mountain bike trail guides that can be found at most establishments.